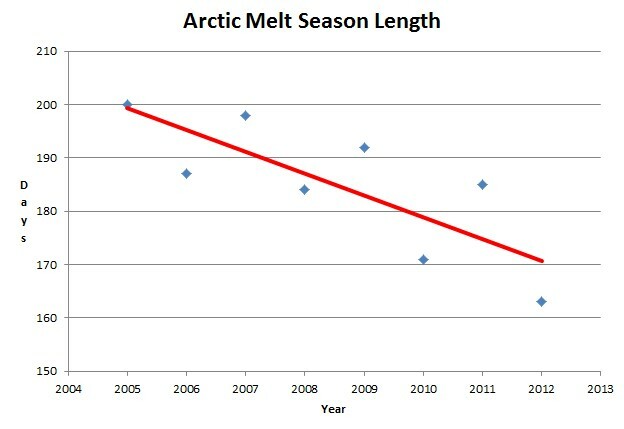 According to JAXA, the Arctic melt season (date max minus date min) has gotten about 30 days shorter since 2005. If the melt season ends in the next eight days, 2012 will be the shortest on record. It is possible that this will happen, because almost all of the remaining ice is thick (1-5 metres) and temperatures in about four days are forecast to get very cold across almost the entire ice pack. More likely it will come in second shortest after 2010. It is worth remembering back to 2008, when Mark Serreze forecast an ice-free pole – because the ice was so thin. The core of the ice pack has thickened considerably since then. There has been no statistically significant warming for about 18 years. So the air hasn’t caused changes in Arctic ice. Thus, global warmers need to stop screaming about changes in Arctic ice because of “global warming”—if they are able to. Inquiring minds want to know how they can make this claim? JAXA shouldn’t be calling the time from winter max to summer minimum the “melt season”, because that is not relevant to the Arctic Ocean where the melt starts months later. Anyhow, the time of the summer minimum has been getting later and is now near the end of September. So the melt season is unlikely to “end in 8 days”. More likely to be about 3 more wks till the minimum. Also, the reason the JAXA data shows a shortening is because the winter max is getting later faster than the summer min is getting later. Nice try, but another failed grasping at straws. What if that warm water, especially on the Atlantic side, turns to cold? As in the case of the Pacific Decadal Oscillation? The cold water will cause the ice to freeze up more and expand. Check out the locations of 2021I, 2012J and 2012L. All three are in areas that should be around 2m thick according to the ACNFS map. The actual thicknesses are 79, 91 and 149cm. This agrees well with the formal validation of ACNFS thicknesses, which found that it over-predicts by an average of 1m. Very important point Steve, thanks for emphasizing it. That’s the whole point about the great oscillations in ice extent in the last years (specially after 2007), between maxima minima. I still believe that ice melts during interglacials. I don’t think that the Atlantic ocean or the pacific ocean are likely to freeze in the present climate it is a block to the maximum extent of sea ice in winter,sea ice tends to form close to shorelines or in the arctic ocean.Ice formation is linked to SST of the Pacific and Atlantic I am sure but I think that low air temperatures can cause sea ice to form along shorelines.I can give an example of this during the recent cold winters that we had in the UK as well as Europe if daytime air temperatures never get above freezing for a few weeks then rivers start to freeze up and it is the same with shorelines.I think that we have had more snow fall around the arctic this year than we had in 2007 which only started in late September /early October in 2007.I don’t see why we should have the late freeze up of sea ice that we had in 2007.When the minimum is reached though is determined by certain people who have taken on this task to decide when the Arctic minimum has been reached and it would not surprise me if it is decided that it happens in late September.